After 20 years of experience and having worked with many methods and techniques, I have chosen to create my own exclusive method. The eyebrow has to be very natural once the color has settled and it does not have to turn towards other colors or even worse than the hair-to-hair work is matted and becomes a streak. Remember: A natural eyebrow is not a tracing of one another, Nature does nothing symmetrical but at the same time it is the most beautiful and harmonious. My experience has driven to me to develop my own method at some point in between the tattoo and the micropigmentation. Eyebrows are redefined with a three-dimensional effect by using different shades of hair and interspersing needles of different thicknesses. Dermopigmentations age, but they must do so while maintaining their stability. 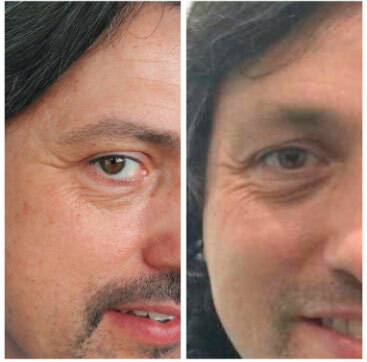 Like a tattoo that lasts over time, the dermopigmentation done with my method has a very good aging. And since you are not a canvas, you should have a maintenance / review of work about a year and a half or 2 years. In this way you can always enjoy good eyebrows that hold short distances, no one will notice anything strange. Now you can relax, you will never lose the frame of your eyes! An own method in 3D (three-dimensional) to give more naturalness to the eyebrow, is a mixture of tattoo and micropigmentation. I work with different shades according to the color of your hair. Give a harmonious and flattering shape, makes an immediate lifting effect, antiaging 10 - 15 years (see testimonies below), more open and bright eyes. Eyebrows that have always had little hair are arranged to go more in line with your style when they are too light and do not give expression to the face. It will give you security because you will not have to paint them anymore or they will be deleted in the pool or the beach. You will have an impeccable image all day. When they have fallen by stress or over the years they recover their image again. With an eyebrow you can change an expression of the face, more attractive, more feline, gives character ... (we design our expression). One of the main concerns of my clients is to know how their eyebrows will look. Will they be too dark? Are they going to inflame me? A picture is worth a thousand words!! Watch photos below before and after the treatment. It had been a few years since looking at myself in the mirror was hard for me. I did not recognize my own face, my usual expression. And everything was because in a short time I had been losing the hair of my eyebrows. An affirmation of this kind may seem banal when there are many diseases that cause much more serious situations, but the feeling of seeing you without eyebrows is devastating. For many hours, of many nights I dedicate myself to look for a solution for my problem. Among all of them that are not many, I began to try the simplest: eyebrow pencils, mascara for eyebrows, templates, shadows and similar whose effectiveness is relative, if not nonexistent. Initially I had ruled out surgical solutions such as Micrografts, first because it scared me and also because they are not particularly affordable solutions. Then in one of my frequent visits to the web, I discovered the buzzwords that were going to make me smile again: Micropigmentation. It may seem strange that such a term, by itself, was the remedy to my problem, and that is the case, because if behind it there is no responsible and qualified professional, Micropigmentation would be nothing more than a compound word. That’s where the professional capacity of Isabel Arias comes into play. As in almost all these techniques, even more being innovative, the competence of the professional is basic; his experience, his aptitude and skill are fundamental. We speak of a technique in which, in addition to the right instruments, a special talent is needed to - as one who faces a blank canvas - make the expressions that the time was born reborn and, when you look in the mirror, you will recognize yourself again at. I must also say that it was very important for me to feel understood, and in that, the role of Isabel was essential. It is a woman’s heaven, affectionate, close, and also transmits it to impregnate your optimism and confidence.